Observation - Carline Thistle - UK and Ireland. 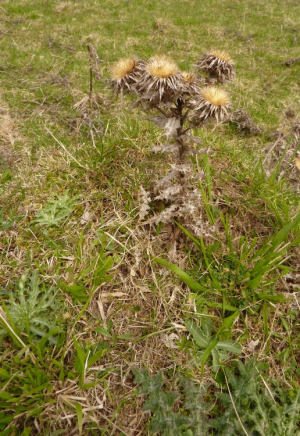 Description: Carline Thistle growing on an ant hill. The surrounding clay soil is probably too wet for this species and a number of plants had grown on the drier ant hills. Carline Thistle growing on an ant hill. The surrounding clay soil is probably too wet for this species and a number of plants had grown on the drier ant hills.